Film following a cast of Nottingham amateur actors who are staging a production of Puss in Boots, reflecting the vital and life-changing role the theatre plays in people's lives. Storyville presents a heartfelt and heartbreaking documentary following a cast of Nottingham amateur actors staging a production of Puss in Boots. It tells the story of how a small community theatre fights to keep afloat in austere times. With arts subsidies slashed, the cast must rely on ticket sales to keep afloat. This hilarious backstage glimpse follows their attempts to rehearse, provide costumes and scenery on a minuscule budget. Malfunctioning pyrotechnics and a donkey costume that exposes more than expected are just some of the challenges they face. With a cast of amateurs, some of the challenges are human rather than technical. The film follows their attempts to master the singing, dancing and acting required for a pantomime - a greater challenge than Shakespeare, according to one of the participants. The film movingly uncovers what it means to the cast, reflecting the vital and life-changing role the theatre plays in people's lives. What made you first want to explore the subject? Pantomime is an essential part of my Christmas tradition and when I look around the theatre I know that is a shared sentiment. I love shouting “It’s behind you!” at the top of my voice, the cross dressing, the contemporary references and the really unpredictable bonkers stuff. I've been to a lot of pantomimes but when I saw the panto at the Nottingham Arts Theatre in 2011, I knew I had found something really special and that I felt compelled to make a film. Peter Wintonick, the documentary maker, said in his personal doc manifesto that making films is “like falling in love”. I guess I fell in love and just couldn’t shake it. There was a lot to fall in love with – the home made set, the regional references in the script and that there was a really enticing mix of gifted and indeed less gifted amateurs on stage. I knew that I would never see the same combination of people on stage in any other theatre. I just kept asking myself “I wonder what his story is”…”I wonder what she does for a living”. I wanted to know more about everyone and more about what goes into putting the show on. I am obsessed with uncovering the "glimmer" of the person underneath a portrayed personae. With actors the potential for uncovering this is heightened as I can explore the gap between on and off stage. The film touches on similar themes I have previously explored in my films The Great Hip Hop Hoax and new film Orion - the desire for fame and the transformative role of the spotlight. It also references the shared sense of community in SOUND IT OUT. Like SOUND IT OUT Records, Nottingham Arts Theatre is also at a precarious moment in time as it is feeling the current climate of austerity. If this theatre closes it's not just bricks and mortar that we lose, it's history and community. As a microcosm of amateur dramatics I hope that people watching Panto! will recognise things from their own experiences of taking part in theatre, or indeed sitting in the audience. How hard was it to get access? The group were rightly trepedacious at first, they hadn’t heard of my previous films (and I think still haven’t watched any of them) but they trusted me and my approach. I always want people to recognise themselves – for good and bad when they see the final film. It’s harder than ever to persuade people that you’re not going to stitch them up like so many reality programmes they see on television. As soon as the company said yes they were completely generous and open with me. The nature of the film meant my team and I were filming them during dress rehearsal and performances when they were at their most nervous which was tough. They are very happy with the film now but at the time it was not without its challenges. What about funding for the film? Funding is always difficult but it can be especially hard to raise money for a character based observational doc based around an event that hasn’t happened yet rather than a story that is, to use TV parlance, “urgent”. This sort of film is all in the telling and so hard to prove ahead of time in order to attract funding. We originally pitched this for a UK funding scheme but didn’t get through so we decided to just press ahead anyway. Just like SOUND IT OUT I knew that endlessly pitching this film would kill any enthusiasm I had for it and I strongly believe that filmmaking is about actually making films, not just talking about it. The film is a Co-production between my indie Glimmer Films and Met Film Production. My superstar producer Al Morrow raised a small pot so we could pay my crew and get the film shot and then further support came from Europe to pay for the edit. Like every film, it’s been a leap of faith to get the film made. The film was then commissioned by BBC Storyville when we had a rough cut in place and I’m thrilled the feature cut will be going out on BBC4 this Christmas. What were the challenges of filming? I was interested in multiple view points and angles so we ran multiple cameras throughout the dress rehearsal and performances – from a C300 in the wings, a go pro attached to actors and on the set, cameras on the audience and I had a 7D in the dressing rooms. It made the edit very unwieldy at first – there was just so much footage to manage but it also meant that some events were captured by multiple viewpoints – for example the donkey. We see his costume being put on in the dressing rooms, his first appearance on stage, the reaction from the wings and then the discussion of what to do with these “men in tights” in the aftermath. All pieced together from four different viewpoints. When moments like that came together in the edit it was really satisfying. It was incredibly hard to relax when the run of the show was on. I was in town one day with my daughter Christmas shopping and I knew the panto was on that day, so we ended going in, setting a camera up and filming as an audience member. I was haunted by the knowledge that there was a very limited amount of time to capture everything we needed. What were you most surprised to learn in the course of production? I was surprised about the absolute disconnect between the pragmatic management of theatre and the idealist company that create work for it, a real clash of approaches inhabiting the same building. A few weeks into rehearsals the theatre management made the decision to cut the time allocated to the am-dram company to “get in” and do a dress rehearsal in the theatre from their usual five days to just two. The absolute havoc that decision caused is shown in the film. What has been the response to the film in Nottingham? It’s been completely overwhelming to be honest. How is business at the Theatre? I think it’s always going to be a struggle as the theatre has to be self sufficient, it doesn’t receive any outside funding but audiences are loyal and regularly go to the theatre. This year’s panto is selling well – it’s Robin Hood and the Babes in the Woods. 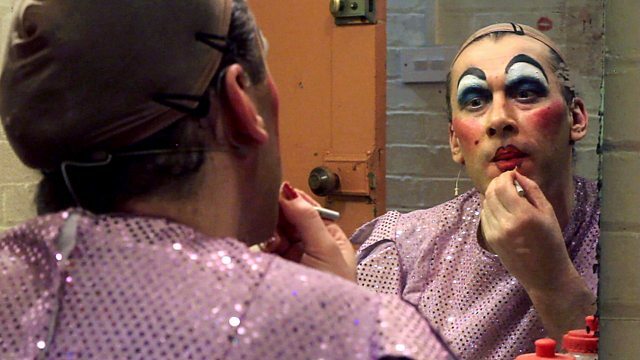 Amanda Hall has written it again and Mike Pearson who plays Puss in Boots in our film has now taken on the role of dame. I have my tickets and I can’t wait to see it. I really like Jack and the beanstalk – It’s a chance for companies to show their ingenuity with some home made bean-stalk magic! In terms of favourite company I’ve been going to see the Nottingham Arts theatre panto for a few years now – it’s without a doubt my favourite in Nottingham. Others may offer more sparkle or b-list celebs but none quite offers the same amount of heart. Also the cast go outside after the show and you get to meet them, it’s a very special experience. Which Panto role would you audition for – and why? My editor Lucas Roche and I spent so long watching the Puss in Boots during the edit that by the end we were word perfect and knew all the dance moves. We often joked we should audition for this year’s show but there’s just no way I could do it. In the film you see The Dame and The King in the wings, waiting to go on stage with the nerves just washing over them. I’m not sure I’m that brave. If I had to pick a role I’d love the quick costume changes and the big wigs of the dame.